The other day I saw a Nike commercial that was about skateboarding stereotype—it shows the perception of how people see skateboarders. They see us as adolescents who never grew up; like our sole purpose is to invade or destroy other people’s property and stress them out. They see us like we’re some criminals because we do something we love. JB Gillet said in Transworld’s skateboard movie called “First Love” how those people could never fully understand what skateboarding means to us and what’s the feeling we get from it. I perceive skateboarding as something where I can free my mind—it’s like meditating with my eyes open. It’s a mixture of having fun and being free which makes it all so interesting. I don’t know whether it’s a constant rush of adrenaline or the feeling of freedom that keeps us addicted to it, overlooking the injuries or pain. 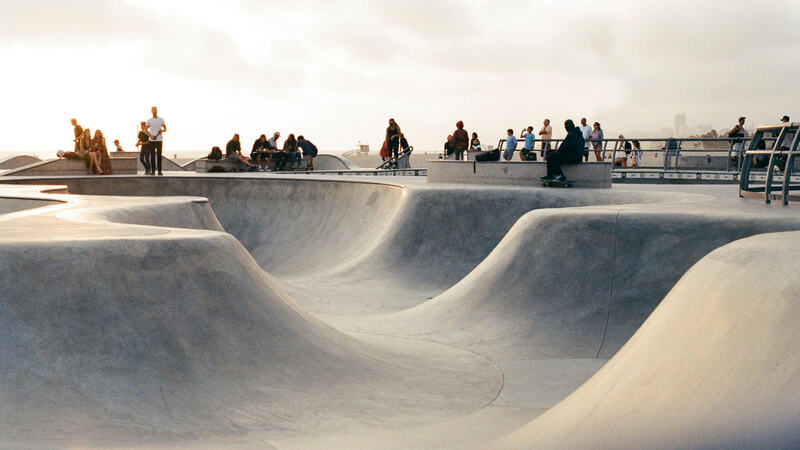 Although freedom plays a massive role in skateboarding, you feel connected with other skateboarders not just because you share the same feeling with them, but also because you share the same point of view and vision—a vision to do something you love. Imagine yourself in a community where you are accepted unconditionally — no matter where you’re from, how old are you or how you look like. Your cultural background and the color of the skin is meaningless. You’re accepted just being who you are. Skateboarding itself has many possibilities. Not only because there is nobody that will tell you what to do, where to do it and how to do it (unless there is a trick tip), but also because there is an endless list of trick variations and skateboarding styles. Every skateboarder is unique because they add their personality to their style. For every individual skateboarding means something different. For somebody, this is a way to escape from all the troubles, and for others, it’s about pushing their limits so they can grow. All I can say for certain is that skateboarding is everything you want it to be. In this world full of influences it’s hard to find the differences between what you want and what you think you want. Constant assault through either media, celebrities, the society you live in or even by the people you are influenced by is putting a heavy burden on individuals in the way of how to live life or what is right, cool and what’s not. Let’s not forget how fast and busy lifestyle has driven us to the point we stop spending enough time with ourselves. That brings massive consequences. People don’t know who they are anymore because they aren’t connected to their inner voice. That can lead to rapid (in most cases wrong) decision making. Skateboarding helped me become independent. It taught me how to set and achieve goals, how to challenge them. But most importantly I learned perseverance—how not to give up and how to get up when you fall. I’ve been skateboarding for more than 14 years now, and I’m still as passioned as in the beginning. I still get a rush of excitement every single time I step on a skateboard and start pushing. That’s passion! Passion is the spark we all need to start something. It’s the driving force that helps us go through the high and low points of our life. Passion is like oxygen—without it, we can’t perform at the highest level. It’s the only way that leads to great work. There are a million combinations of tricks, and every skateboarder does them differently. You can immediately spot someone that’s trying to fake a style to look cool. Humans beings are social animals. Because social approval is engraved mainly in our brain, we see a lot of people trying to be something they’re not. I can’t stress enough how bad this is. Instead of trying to do what is fashionable or trendy think about your unique strengths and double down on that. Don’t try to please everybody, instead, satisfy your needs first and the rest will follow. When you start becoming who you are the environment, you live in starts adopting in your favor. With every move as skateboarders, we risk an injury for a greater good. That state of a complete focus when you’re on top of the stairs visualizing the trick in your head over and over again. We’re risking it for the adrenaline rush just before trying it for the first time. There is no greater feeling than overcoming something that seemed impossible before. Without risks, you’re indeed playing it safe, but that also means nothing better can happen to you. Every great person had to risk something to come to where they are today. Fear plays a significant role when you start overthinking things but remember, in the majority of situations the odds are better than you think! Similarly to risks we know that we’re eventually going to fall on the ground. Instead of avoiding that we had to learn how to fall properly. That skill plays a critical role between a severe injury and a minor scratch. Don’t be scared of failures. They will come no matter how hard you try. So instead of avoiding them embrace them when they come – and they will come – and make the best of them. Take that as an opportunity to learn by evaluating what went wrong and why it happened in the first place. One of the great things about skateboarding is that you always have to challenge yourself. When you reach a specific goal, there’s always the next one to pursue whether this means perfecting a particular trick or learning a new one. I know this is a no-brainer, but you would be surprised how many people don’t practice their skill-sets. This is key for maintaining your passion. Don’t allow yourself to turn your workflow on autopilot. Challenge yourself regularly and get yourself out of your comfort zone. If you’re not having fun while getting to your final destination why do you think that will change at the end? It’s nothing more heartbreaking than looking back on your life and regretting you didn’t enjoy the ride. Skateboarding changed my perception of the world. I can’t imagine where’d I be at this very moment if I’d have never met skateboarding. It changed my life forever. I’m not saying that team sports don’t please me, but there’s something different about how skateboarding does that. The feeling of being a manager at the endless list of possibilities. It is unexplainable. So next time you see somebody skateboarding stop for a second and observe what is going on. You’ll quickly start connecting the dots I was talking about in this post.